3 key strategies that deliver maximum impact on service quality. Contact centers today are facing multiple, and sometimes competing, pressures. The need to improve operational efficiency, integrate new technologies, support multichannel environments, exploit and manage social media, and hire and retain agents, while still keeping customers satisfied and loyal can all be daunting for many organizations. Putting the customer first, achieving a balance between efficiency and customer satisfaction (experience), and focusing on employee engagement are three key strategies that go a long way toward improving the quality of service in contact centers. To improve the quality of service in its contact centers, companies have to know and empathize with their customers. That directive is deceptively simple, as no two customers are exactly alike, and companies are now expected to essentially treat each customer as an individual when he or she contacts them. Fortunately, both journey mapping and persona mapping can help companies and agencies get to know and understand their customers beyond a name and phone number on a screen. In journey mapping, companies build out the topology of their customer touchpoints. They document the path(s) their customers take from a navigation or process perspective, analyzing and visualizing how a customer may engage with the contact center via all support channels. That is, they try to predict how customers might interact with businesses from the moment they hit the customer service queue and are put on hold until the moment that their question is resolved. To envision the different journeys a customer may take, call center executives analyze different citizen objectives. This information comes from data including the types of calls taken (hours of operation, availability of products, problems with orders and so on), and the resolution to those calls. Once they examine the data underlying the calls themselves, executives can put together different paths that customers might follow. Consumers expect and appreciate both efficiency and courtesy when they contact businesses. Tuned-in executives will set up the most efficient paths for each objective that a consumer may have when contacting a service center. Doing so creates good will and leads to improved quality of service and enhanced customer or citizen experience (CX), and can drive deeper customer loyalty. Persona mapping, while different from journey mapping, is just as important to improved service. It involves visualizing who customers are, and uses that visualization and subsequent data gathering to route customers to the correct and most efficient path. In federal agencies, citizen identity plays a large role in determining which path citizens take as they work toward resolution of queries or problems. When contacting the Department of Health and Human Services (HHS), for example, physicians and medical professionals begin their journey on one path, and ordinary citizens take another one. Ordinary citizens may take different paths depending on whether they have contacted HHS before, whether they are a U.S. national or not, and whether they speak English or a different language. All of these different factors contribute to a citizen’s persona, which, when combined with a citizen’s objective, should inform a citizen’s journey. The more individualized and correctly tailored a journey is, the better service a citizen or consumer receives. There is no magic formula for creating an ideal balance among efficiency, quality of service and a positive customer experience. 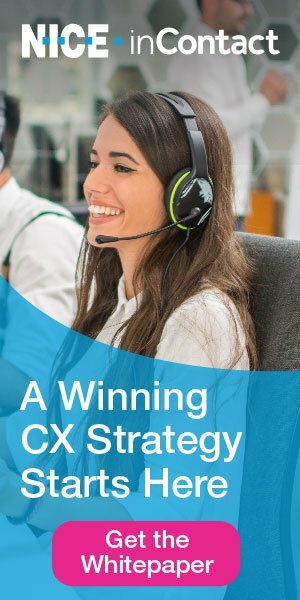 Instead of looking at the three goals in opposition (“If I’m really efficient, I can’t worry about making my customers happy,” and vice versa), contact center executives should think of them as parts of a whole, working together in tandem, informed by metrics, to achieve the best possible outcome for consumers. Metrics are important, both to gauge agent efficiency and to obtain a clear picture of how consumers feel about the service they are receiving. They give an idea of how many calls agents have taken, how long they spent on each call, how long consumers had to wait in the queue, and so on. If consumers take the time to give feedback, Csat surveys can also figure into the data. But metrics can be misleading; first-call resolution means different things to different contact centers, and for a consumer, being transferred to a different department hardly feels like an issue has been resolved. Measuring consumers’ emotional experiences during and after their interactions with a company is much more effective than simply relying on data and Csat scores. Contact center executives should also consider seasonal trends, global news, system failures, in-company policy changes and the like when interpreting the data they collect in order to measure true emotional response. Technology also provides helpful tools for measuring consumers’ emotional responses during points of contact. Contact centers can monitor and record calls and “punch-in” to calls as needed when agents need additional support. Speech analysis, speech recognition and real-time analytics software give sophisticated insight into the emotional content of calls, allowing for instant mitigation and later retraining opportunities as needed. As contact centers dive deeper into data and learn more about how consumers feel during points of contact, they will naturally become more efficient at giving consumers what they need, and service will improve. Providing great customer service starts with hiring agents who are service minded. Finding the right people has become more challenging, particularly as more contact centers also fill the role of help desk and require agents to have specific technical skills. While agents can be taught to recognize why a customer is responding in a particular way, it certainly helps if they come to the contact center with a service mentality. Focusing on agent happiness can be simple, such as offering small financial incentives or holding internal team competitions. Agents also appreciate recognition for their good work. In addition to recognizing outstanding service within the contact center, customers can be encouraged to let the company know when they have received outstanding service. Employees receive a strong message of support when employers are truly interested in helping them grow—both in their careers and in their lives. Some contact centers use role playing or games to help teams of employees figure out best practices when handling particularly difficult customers or situations. Others encourage agents to study a particular field of interest by providing online or classroom training. When employees feel that they are valued, supported and recognized, they are much more likely to provide excellent customer service. When augmented by a balance between efficiency and quality consumer interaction, as well as a focus on putting the customer first, better quality of service is well within reach.